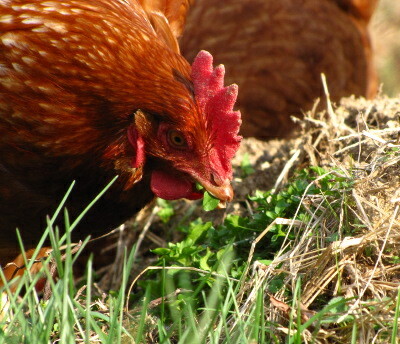 “I believe in the power of probiotics for my chickens health. No farm should be without these products. There has been an “eggsplosion” of late in the poultry industry for backyard chicken owners, pet enthusiasts, small farmers as well as now sustainable poultry farming has increased in all areas of the country. Here at Blue Star Ranch, I strive in everyday teaching customers, readers and even just stray callers to our location the proper care of poultry. The sustainable growing and harvesting of poultry for both eggs and meat is on the rise just about everywhere, country, suburbs and sometimes city dwellers too. If you have ever raised meat poultry verses egg layers, then you know how very different these birds can be. Meat and egg poultry birds vary greatly, there are a few sustainable breeds that are both “duel purpose” and quality at that. When processing meat birds its always a good idea to have concrete plans before harvest day. If egg layers are more your style, its a good idea to have a replacement plan for your chickens and replace (harvest and hatch or otherwise) 1/3 of your flock each six to twelve months to assure you a constant supply of eggs. Do not overlook the fact that eggs and meat are MONEY! Learn how to barter with your bounty. You will come out the better on each deal, almost every time you exchange eggs or meat for product or services. YOU are in demand. Don’t forget about that. (yikes! shudder and cringe!!!!) I know these people are in for a tough time of raising chickens based on what they learned from their grandparents farm collecting eggs as a child…which makes them qualified to raise chickens today and relying only on those childhood memories. But this is how people learn I suppose. Hmmmmm lets think what do these two problems have in common? Bacteria. I have found that when the temperature’s drop or rise more than 40 degrees in a 24 hour period. (this is almost common in Texas!) that the bacteria in the soil will begin to breed and spread like wildfire. Causing illness, slow growth or even death to your flocks. This is why I use natural and organic probiotics and have a regular regimen in dispensing to the flocks. In fact, I CAN”T raise chickens effective without it. Moreover Its very important to have a goal when starting a chicken pen. Make a plan for yourself and family, set goals… don’t just “wing it!” To just build a coop and put chickens in may result in failure. What I have learned in raising chickens is that… there is ALWAYS more to learn. No one knows it all. Experience is the best teacher. So is ADMITTING your mistakes. If along the way while raising chickens you determine what you are doing is not working, make a chart of your activities in and around your coop. This easy chart can be of help, please share it! If you are more adventuresome and want to build your “nest egg” and start a business. PLEASE start here first. I’ll be happy to share my knowledge to help you start a sustainable meat or egg farm. What have I learned? Preventing mistakes is much easier than making mistakes and correcting it later. To all the readers: happy clucking and I’ll write again soon!